Merry Christmas farmer! Today is Family Farm’s BIGGEST Christmas Turkey Dinner in HISTORY! Deck the Halls and Fa-la-la-la-la! This dinner is going to be AMAZING! 1. Just need a few more ingredients to finish things off and voila! The whole gang’s here farmer, EVEN Tasha and Toby’s parents. I’m SO excited, but also a lil’ nervous! 2. Help yourselves to some appetizers, then you can start decorating your Gingerbread Cookies to eat after dinner. DING! Oh goody that’s the oven timer; dinner’s ready! 4. We got buttery corn, herbed potatoes, bacon scallops, chocolate dipped bread, and...wait! Something’s missing! *GASP! OH NO, the TURKEY! I forgot the TURKEY farmer!? 5. I remembered EVERYTHING else; sweet garlic beans, candies, even a Yule LOG but FORGOT THE TURKEY!? Who forgets the Turkey for a TURKEY dinner at CHRISTMAS time? 6. I’ve officially RUINED Christmas! It’s just not going to be the same without TURKEY! I’d say you might as well just eat the desserts for dinner but I burned that too. 7. The rest of the bacon AND the Lemon cake; burnt to a crisp! UGH, I am so embarrassed, I really wanted to make a good impression on Toby’s parents; I’ve wrecked everything! 8. I’m locking myself in a closet and not coming out! Oh great, and now a bunch of carollers show up! Huh? Those aren’t carollers, that’s the farm family! They followed after me! 9. They’re outside the closet singing my favourite Christmas carols trying to get me to come out. They even made me a plate of all my favorite foods! How can I say no to that? 10. It took some time but I finally came out. Everyone hugged me and reminded me that Christmas isn’t about the Turkey or the perfect appetizers or desserts or even gifts! 11. Christmas is about family, friendship, LOVE! They’re so right, how could I forget? So what if I made every dish imaginable EXCEPT the turkey for a Turkey Christmas dinner. 12. What matters most is that we have each other! Sorry for being a overly dramatic earlier. What are we waiting, let’s celebrate! Wishing you a Merry Christmas too farmer! 1. x 7 = ? 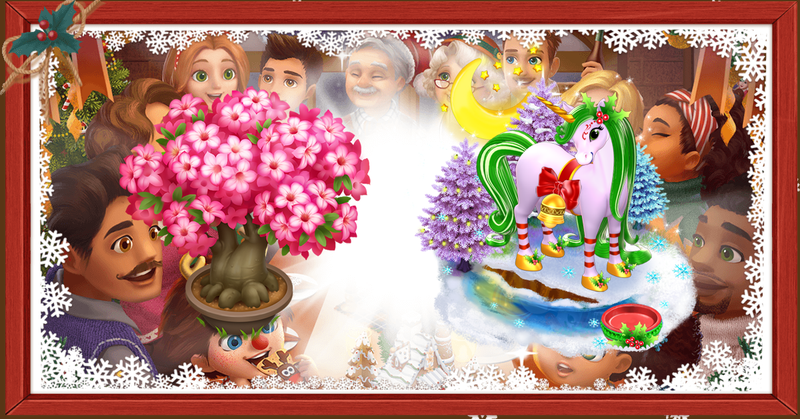 The final prize is Azalea Bonsai Tree or Elf Unicorn. Reward: Elf Unicorn, Not sure why the prizes are not put for a number of these missions any more.